The Hop on Hop off bus in New York is a good way to explore the city. 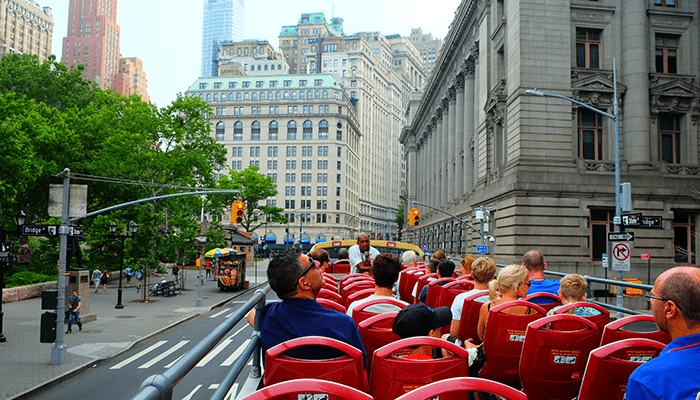 These buses, also called sightseeing bus tours or HOHO buses, drive through Manhattan and Brooklyn. They stop regularly at various places where you can choose to either hop on or hop off. 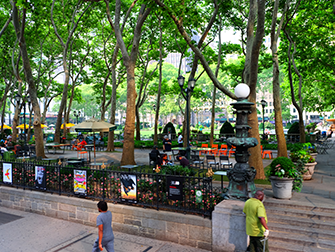 A perfect option for those who are visiting New York for the first time! Which Hop on Hop off bus should I take? Option 1 (my favourite): If you want a low-priced package that combines Hop on Hop off bus tours with attraction tickets and that offers you lots of freedom, this option is for you. The bus tickets are valid for 72 hours and you can visit either 3, 5 or 7 attractions. Option 3: If you want to hop on and off for 48 or 72 hours and see as much as possible without visiting attractions, you should go for this provider. A Hop-on Hop-off cruise is included as a bonus and you pay the lowest possible price. Extra: Are you considering to buy a discount pass? Then the Sightseeing Day Pass is a good option. With this pass you can use the Hop-on Hop-off bus for the entire duration of your pass. So if you buy the pass for 10 days you can use the bus for 10 days too! How does the Hop on Hop off bus work? You can find Hop on Hop off buses more and more in popular cities. These double-decker buses drive past the main attractions in the city and stop regularly at various stops along the routes. You can decide if you want to hop off to explore the neighbourhood or stay on the bus. You are in control. During the ride, the guide will tell you all about the attractions you pass by. The guide stands either on the bottom or the top deck of the bus. If you’re not seated close by, the audio system in the bus will allow you to follow everything they explain. In all buses you can make use of free earphones, but you can of course also use your own headset. All providers offer a variety of routes (or loops). Depending on the ticket you purchase, you can do one or multiple loops. Online. You can buy tickets for the Hop on Hop off bus that are valid for a certain period of time, usually 24, 48 or 72 hours. Your ticket will be activated when you board the bus for the first time. If you first use the bus at 10:00 in the morning, your ticket will be valid until 10:00 the next day (or the day after, depending on your ticket). The 1 day ticket for Big Bus is valid for the same day, but will be extended into the next day if you redeem it after 15:00. The amount of hours is always consecutive. If you buy a 72-hour ticket, this ticket is valid for 72 hours from the moment it is activated. For instance, it’s not possible to make use of your ticket for 24 hours, then not use it for a couple of days and hop on the bus again during the last 48 hours of your trip. Eric’s Tip: The Hop on Hop off buses aren’t very suitable to use as a transport means, but they’re perfect for sightseeing. The buses drive quite slowly and sometimes get stuck in traffic. 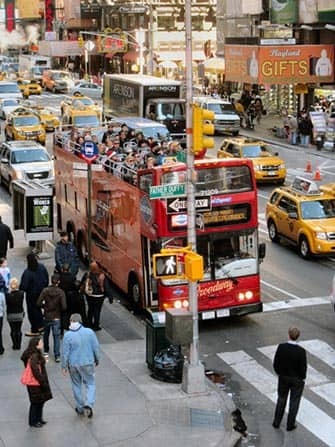 That’s why I recommend making use of these buses particularly during the first day(s) of your trip to New York. If you’re not sure about the amount of days, I’d suggest you purchase a 2-day ticket that will allow you to do several loops. Big Bus also offers an extra route: the Harlem loop. Which providers can I choose from? 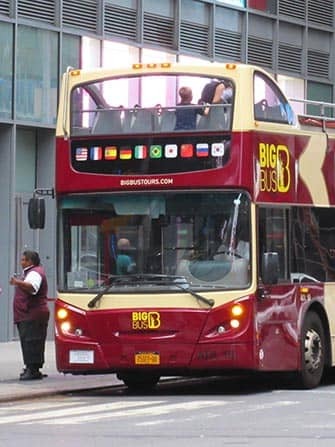 Big Bus in New York is my favourite Hop on Hop off bus provider. They have the nicest buses and they’re often less crowded than buses of other providers. Another good reason to choose Big Bus is the fact that their 1 day ticket allows you to do the Uptown and Downtown loops whereas other providers only allow you to take the Downtown loop with the same ticket. The Gray Line Hop on Hop off bus provider offers 24-, 48- or 72-hour tickets. You can also opt for the Freestyle Package which includes bus tickets and tickets for three attractions of your choice. The CitySightseeing Hop on Hop off bus provider offers pretty much the same loops as the red buses. You can book several packages that include tickets for the CitySightseeing buses. 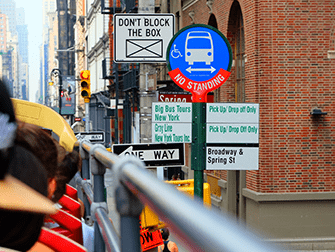 You can purchase a package that combines bus tickets with a harbour cruise, tickets to Woodbury Common and Top of the Rock or tickets for the ferry to the Statue of Liberty plus Top of the Rock or The Empire State Building for instance. Eric’s Tip: As a New Yorker, I didn’t think much of these buses until I bought a ticket for my website. I have to admit that I saw the city from a different perspective. Sitting on the roof of the bus and listening to the guide is nice and very relaxing for people visiting New York for the first time. And what about the other providers? There are indeed other Hop on Hop off bus providers than the ones I’ve mentioned above. When you’re in Manhattan, you’ll probably see double-decker buses of other organisations too. The reason why I don’t recommend these bus tours is because I’ve either had a bad experience with them or because their offer is not as good as the options mentioned above.